Aside from death and taxes, the only other thing we can be certain about is that well, life happens, and life will always involve emergencies. While no one likes to think that the unexpected can happen to them odds are we all will experience one or multiple emergencies of some sort throughout our lives. 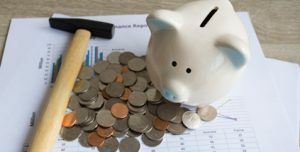 According to a survey from Bankrate, while 45% of adults said they or their immediate family had an unexpected major expense in the past year, only 4 in 10 Americans have the savings to cover such an emergency. Simply put, American’s have a tough time thinking about or financially preparing for the unexpected, and when something happens we just don’t have the funds to pay for it. Having a better understanding of why you need an emergency fund can help in your preparations to set aside 3-6 months’ worth of living expenses and ensure some peace of mind when things don’t go as we planned. Consider the likelihood of these scenarios occurring in your household. In a perfect world, you have a job that you love and is stable, however, most people don’t have that luxury. Your finances could be in jeopardy with a sudden decrease in hours at your current job and necessitate an emergency fund to supplement your income. Or worse, you could lose your job all together and need savings to pay for all your living expenses until you are able to get back on your feet again. You could also find yourself in a common situation of having to move your family to another location for a new job. These circumstances can wreak havoc on your finances unless you have an emergency savings. You never know when the jolt of pain radiating from your jaw means an emergency visit to the endodontist, or your daughter’s biking accident means a trip to the ER. While accidents and illnesses can quickly become an emergency, they don’t have to empty your checking account. Health emergencies can be emotionally draining but with a well-funded emergency savings, they don’t have to be financially draining as well. While you should expect to spend about 1% of your home’s value on general maintenance and repairs each year, there are also large expenses that come with home ownership that are not a usual part of a family’s monthly budget. A flooded basement or other natural disaster can leave you with thousands of dollars in damages not covered by your home insurance policy. Then there is the inevitable event of the need for a new furnace, air conditioning, or roof repair. All home owners need a 3-6 month emergency fund to keep their head above water when the floods, and repairs, are certain to come. Americans spend a lot of money on their vehicles, but one often overlooked expense is the cost of car repairs. In fact, according a AAA survey, one in three drivers wouldn’t be able to pay for unexpected car repairs without going into debt. While ideally these costs should be part of your monthly budget, it only takes the costs of a new radiator or the expense of a new engine to exceed your monthly savings. And while the costs of unexpected repairs can feel like a punch in the gut, consider the costs of replacing a vehicle. If you have a teenage driver you might be all too familiar with the reality of this situation. Automobile replacement and repairs are a part of life, and an emergency fund can ease the pain of these often unaccounted for expenses. Unplanned travel may seem unlikely, but it is a probability for anyone that lives away from loved ones. The illness or death of a loved one, or the birth of your sister’s child can necessitate quick and expensive airfare and rental car arrangements. Having an emergency fund makes it possible to be there for important occasions that weren’t planned for, but you can’t bear to miss. While the above scenarios are some of the most common emergency situations, there is no list that can cover them all. Vet bills, an unexpected tax notice, an unexpected pregnancy, and other unforeseen events with their concurrent expenses are a just a few other reasons you need at least a 3-6 month emergency fund. While life is full of unexpected surprises, it doesn’t need to drain your retirement or increase your debt. Use our calculator to determine how much you need to set aside monthly or in a lump sum to establish your emergency fund. Carefully planning and setting aside money not just for a rainy day, but the occasional storm in life, will keep your finances in control even when everything else seems far from it. What emergencies have you experienced that needed an emergency fund?